I shocked when I saw the level of my page views of Cloudspedia .I know you will be saying that i opened it time to time but no I disabled the system of tracking my own page views. I got this 50% from SEO (Search Engine Optimization) by Google , Yahoo , Bing USA. 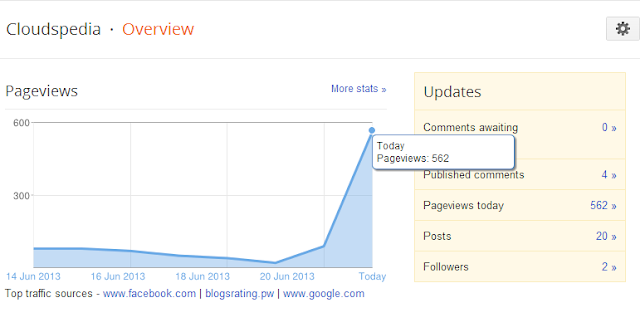 I am getting 70% of page views by the people USA. Yesterday I submitted by sitemap to Google and almost before this week I submitted my sitemap to Bing. That's why i got that visitors. Thanks Visitors ! ! ! ! ! !